Shai Silberman, center, a lecturer in the Charles W. Davidson College of Engineering and the director of Network Services for the university, uses Wi-Fi in his class while students follow a lecture on their laptops. Expansion of access to wireless technology in all of the buildings and many outdoor spaces throughout the 154 acres of San Jose State University has been one of the most dramatic impacts of the Vision 2017 campus improvement program. Started in 2012, the Agility Through Technology segment of Vision 2017 brought uniform Wi-Fi access to classrooms, offices, residence halls, the Dr. Martin Luther King Jr. Library and major campus gathering spots such as the Student Union. Work that led to the installation of hardware facilitating wireless access started during the 2013-14 academic year when wireless access points at the university grew from 500 to 1,600. The entire campus was surveyed in fall 2013 and three contracting firms were brought in to install cabling throughout much of the campus during the winter break in January 2014. According to Shai Silberman, a lecturer in the Charles W. Davidson College of Engineering and director of Network Services for the university, subsequent expansion work has increased that number to 2,500 wireless access points today. The campus has 50 major buildings, including 23 devoted to academics and seven student residence halls. Silberman said the Wi-Fi expansion has cost the university about $2 million to date. 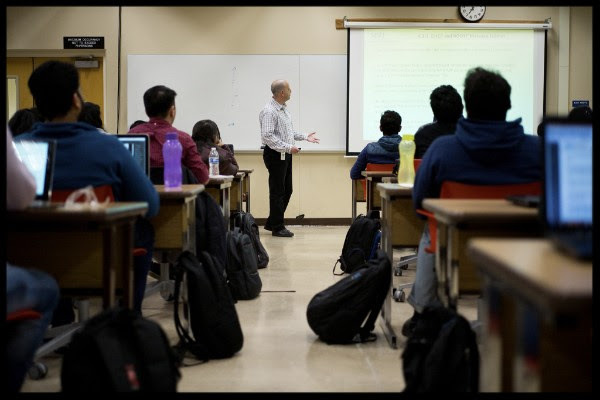 In his computer engineering classes, Silberman said the expanded use of wireless technology has helped him achieve a paperless classroom. Using the wireless network, students can access the university’s learning management system (LMS), Canvas. The LMS system is used by students like Helena Xin every day. Xin and her fellow students will use Wi-Fi access during class for both academic — and, at times — non-academic reasons. “There are times people will use it for shopping and looking at puppies,” she said. Kimberly Cheng, a junior majoring in computer engineering, said she can communicate more easily with fellow students and faculty. She also frequently uses it to gain access to social media. Karthick Sadanap, a graduate student in computer engineering who arrived at SJSU from his home in Bangalore, India in 2015, has found Wi-Fi useful when recruiting other students to his Spartan Toastmasters club, a university chapter of the international organization dedicated to improving public speaking skills. Silberman noted SJSU, a major generator of employees for Silicon Valley, is inthe forefront of universities providing universal access to wireless devices. Since the network has been so successful, it is “taken for granted that it will work, be fast and not deny access no matter how many devices you have connected or people standing around you have connected,” said Mike Wardley, SJSU’s director of Project Management and User Experience.